Murano, like Venice, is a series of islands linked by bridges in the Venetian Lagoon. The population is just over 5,000 (2004 figures). The town is very famous for its glass production. The climate of Murano is classified as Humid Subtropical climate with cool winters and very warm summers. ACTV , Venice's transit company, runs the water buses, "vaporetti", from Venice to Murano at frequent intervals and at many stops. WALK! 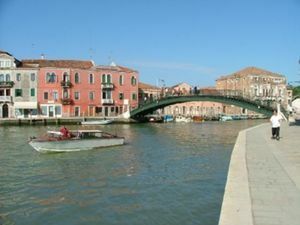 - walking along the many canals is part of the experience of Murano. The island is only about 1 mile across so it is small enough to explore by foot. The Grand Canal, "Canale Grande", splits the island into two. Walking around the island will help you discover the beautiful colors, little shops and restaurants. Basilica dei Santa Maria e San Donato - known for its twelfth century Byzantine mosaic pavement, which is a similiar floor to Venice's Basilica di San Marco, and the mosaic dome in the apse of the Virgin Mary. It is said to house the bones of the dragon slain by Saint Donatus. The bell tower, like most bell towers, is separate from the Church. Chiesa di San Pietro Martire - Church of Saint Peter the Martyr. Built in the 15th century and then reconstructed some years later after a fire. Inside are some art works, such as two canvasses by Bellini. Campo Santo Stefano - notable for its 19th Century clock tower. One of the most visited spots. Ex Chiesa di Santa Chiara - A newly restored medieval church, dating from the early 1200's, reopened to the public in 2015 as a museum, demonstration space and gallery of Murano glass. The Ex Chiesa di Santa Chiara is one of the most historic buildings on the island of Murano. Once a part of a large monastery, it was inhabited by celebrants of various Christian religious orders for more than 500 years. The Ex Chiesa is rumored both to have housed one of Casanova's lovers and to conceal a secret underground passage off of the island. Palazzo Da Mula - The summer residence of the Venetian patricians. The facade features large Gothic windows and Veneto-Byzantine patere and panels from the 12th and 13th centuries. It is one of the few palazzi which escaped the restructuration of the island in the 1800s. Glass-related attractions include the many glassworks, some Mediaeval and most open to the public, and the Glass Museum, housed in the large Palazzo Giustinian near the island's center. "Museo Vetrario" in Italian, offers a century-by-century tour of Venetian glassmaking. Glass Factories - "fornaci". The best glass blowing factories are not open to tourists, but there are some factories that give demonstrations. Interesting to see if you have never seen a glass furnace. Murano is known for its glass worldwide. Besides that, there is not much else you need to buy besides the normal tourist objects, such as postcards and other souvenirs. Many souvenir shops try to pass off cheap Chinese counterfeit glass as real Murano glass. 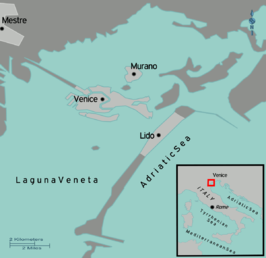 The Venice government protects Murano glassmaking. Look for the "Vetro Murano Artistico" trademark decal in the windows of shops and showrooms that sell authentic Murano glass. 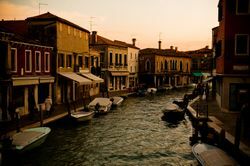 Beware of the scams offering to take you on a free boat ride to see the glassworks at Murano or Burano. Prices are grossly (300%+) overinflated, and the terms you are told in English will not match the terms in the contract written in Italian only. Don't fall for this scam. If you're staying on Murano overnight, ask your hotel receptionist which of the island's restaurants is open in the evening. Most tourists are day-trippers, so Murano's restaurants take turns staying open for dinner. LaGare Hotel Venezia - Riva Longa 49, 30141 Murano Venezia. In the heart of Murano, the hotel is enclosed in the antique walls of an old furnace called “conterie” and overlooks the Grand Canal of the island. The 118 guestrooms are elegantly furnished and range from 25m2 – 78m2 . The lighting which enhances the rooms in a skilful fusion is designed by the well known Murano glass company, Venini. Every room is fully sound –proofed and features air conditioning, ensuite, minibar, radio, direct dialing telephone and TV complete with free access to Sky, pay-tv, internet connection and free wireless broadband. A permanent exhibition of museum works and designs by Venini can be seen in the scenic common areas. The hotel has an elegant restaurant and bar, which look out onto a characteristic Venetian courtyard. Perfect for relaxing. Al Soffiador - Viale Bressagio 10-11 - 30141 Murano (Venice). Prices from € 80 (Tax included) ($106.70 USD). Check in starts at 10:30 am and ends at 7 pm or needs to be informed that you will be arriving later. Check out is at 11 am. Breakfast is included. On the hotel premises is a restaurant. There are two buildings connected by a garden terrace. Each room has its own bathroom. 2 rooms are equipped to host disabled guests. Hotel Locanda Conterie - Calle Conterie 21 - Murano - 30141 Murano (Venice). Prices from € 64 (Tax included) ($85.40 USD). Check in available after 11 am and late arrivals must be advised. Check out is at 10 am. The hotel lies within metres of the Museo Vetrario and the Basilica dei SS. Maria e Donato. All rooms have a private bathroom. Venice is your hub on the way out to the mainland. Just hop on the waterbus, "vaporetto", to get back to Venice. This page was last edited on 17 May 2017, at 10:04.